Label Distribution Protocol (LDP) is one of the protocols that can be used for MPLS to distribute labels. Other protocols are RSVP-TE, BGP, and IGPs (ISIS and OSPF). This short post addresses LDP and how it works. LDP is very simple to configure. It is basically just one command needed. This is an LDP Hello Message sent by LSR (Label Switching Router) R3. 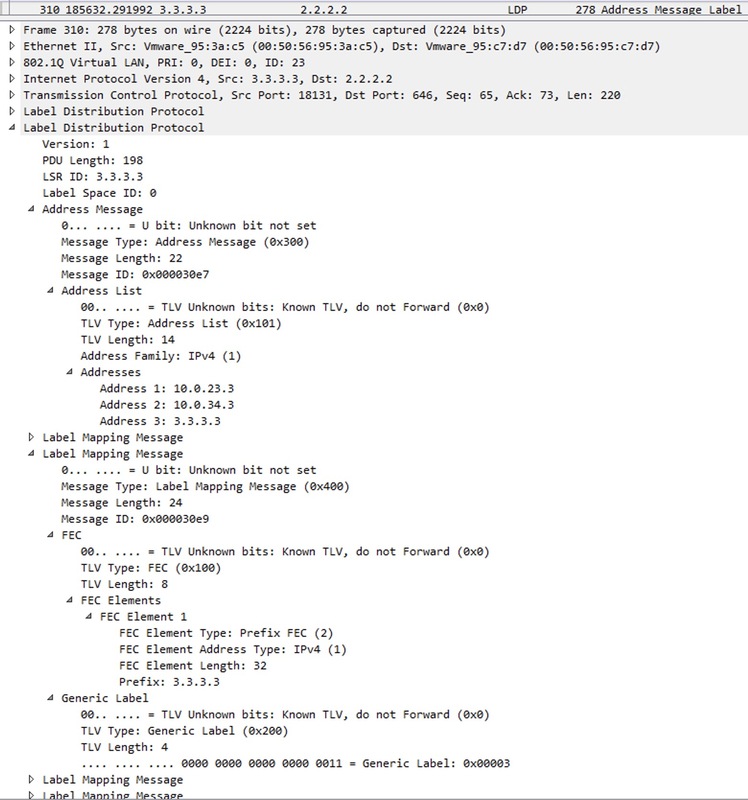 This we can see by looking at the IP header which is sourced from 10.0.23.3. We can also look inside the MPLS header and find the LSR ID of 3.3.3.3 which is R3’s Loopback0 address. The destination of the packet is 224.0.0.2 which is the link local all routers multicast address. And the TTL (not shown) is set to 1. So this truly is a link local discovery message asking to see if any other LDP enabled routers are available on the link. The UDP port numbers are 646 both for the source and destination ports. Finally, in the LDP header, we see an IPv4 transport address. This lets other LDP enabled routers known to which address they should form a TCP session once they’ve discovered each other. So this address has to be routable. These messages are sent after the three way TCP handshake and lets each know the capabilities of each other along with an authentication TLV. First (not expanded) is an LDP header that contains a keepalive. The last LDP header contains the addresses bound to ourselves (essentially all our interface addresses). Here we also see the various Label Mapping Messages that contains the actual labels to be used by the neighbor (R2). I’ve expanded one of them listing the prefix 3.3.3.3/32 which is the loopback of R3 (the advertising router). The label value is 3 which is actually referred to as an implicit-null label. This means that the router receiving this label (R2) should pop (remove) the label before sending the packet to this router (R3). We call this process PHP (Penultimate Hop Popping). This is the LRIB (Label Routing Information Base) of R2 for prefix 3.3.3.3/32. Here we see the label that we (R2) has allocated for 3.3.3.3/32 (200) and also we see the received binding from R3 which is the imp-null label. The important piece of information here is the� Addresses bound to peer LDP Ident. This is where we correlate the next hop to the LDP neighbor. In this case R3 as the LDP neighbor. Now we know that R2 must use the imp-null (pop) action when sending packets to 3.3.3.3/32.